The exercise, which started over the weekend, included the Norfolk-based surface units: Arleigh Burke-class guided-missile destroyers USS Bainbridge (DDG-96), USS Gonzalez (DDG-66), USS Mason (DDG-87), USS Gravely (DDG-107) and USS Nitze (DDG-94), and Ticonderoga-class guided-missile cruiser USS Leyte Gulf (CG-55). 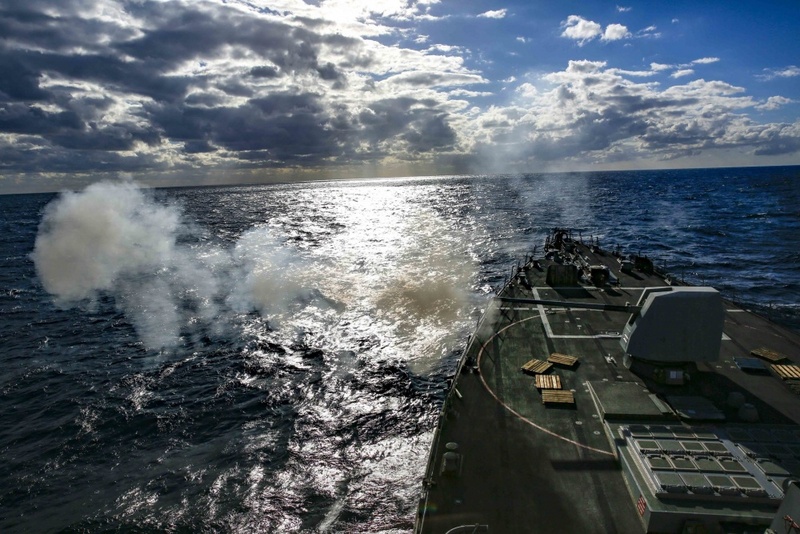 Crews on the ships are practicing a variety of scenarios involving integrated air and missile defense, anti-submarine/surface warfare, amphibious warfare, mine warfare and information warfare, according to the Navy. When deployed, cruiser-destroyer units are tasked with defending aircraft carriers but can also provide offensive missile strike capabilities. 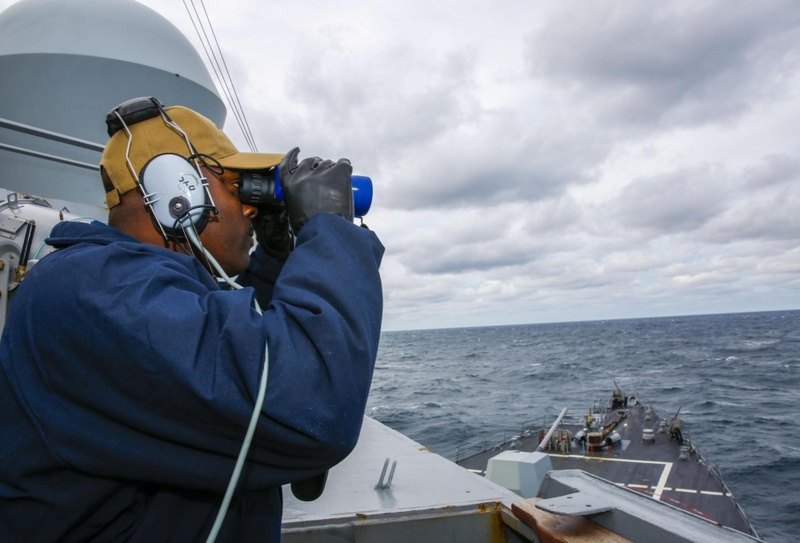 Culinary Specialist First Class Marcus Madison stands watch on the bridge of the guided-missile destroyer USS Nitze (DDG 94) as part of Surface Warfare Advanced Tactical Training (SWATT) exercise, involving the USS Abraham Lincoln Carrier Strike Group (CSG) cruiser-destroyer (CRUDES) units. Navy photo. SMWDC led the exercise. The San Diego-based command, which has two Virginia-based divisions in Dahlgren and Virginia Beach, was established in 2015. The center’s mission is to act as a surface warfare variation of the Naval Aviation Warfighting Development Center (Top Gun), the Naval Information Warfighting Development Center and the Undersea Warfighting Development Center. SMWDC trains subject matter experts – warfare tactics instructors (WTIs) – who are dispersed throughout the fleet, acting as advocates for the surface community’s needs, according to the Navy. “The establishment of SMWDC in 2015 represented the beginning of an important cultural shift in the surface fleet to rapidly increase surface force tactical proficiency, readiness, and combat capability,” Welch’s statement continued. Standardizing training for Pacific- and Atlantic-based warships has become a focus this year for Welch. During the summer, elements of the Kearsarge Amphibious Ready Group (ARG) participated in a SWATT, the first time an Atlantic-based ARG participated in a SWATT. The summer’s exercise was similar to the CSG exercise now occurring. In both instances, the Navy’s goal was to offer crews on both coasts the same training. “While our headquarters is located in San Diego, we have divisions on both coasts and team members in most fleet concentration areas,” Capt. Joe Cahill, the director of the SMWDC sea combat division, said in a statement. Cahill is also the SMWDC’s air defense senior mentor underway for the exercise. “We are committed to increasing the combat power of naval surface forces, with focus on warship cohesion.